you laugh because your dog gets freaked out by a leaf blowing by? Inwardly I cringe cause I can’t believe he’s still so anxious about everything, and I know we’re going to eventually have to work with a behaviourist cause it’s just not something we seem to be able to work through in these five months. But I did have to laugh when the leaf blowing across the street spooked the silly dog. It’s tough to actually see Barney in the dark…but you can see his new favorite toy. He has loved balls since we got him, but his teeth would get stuck in the harder (real) soccer balls/football, so we had to keep him away from them. 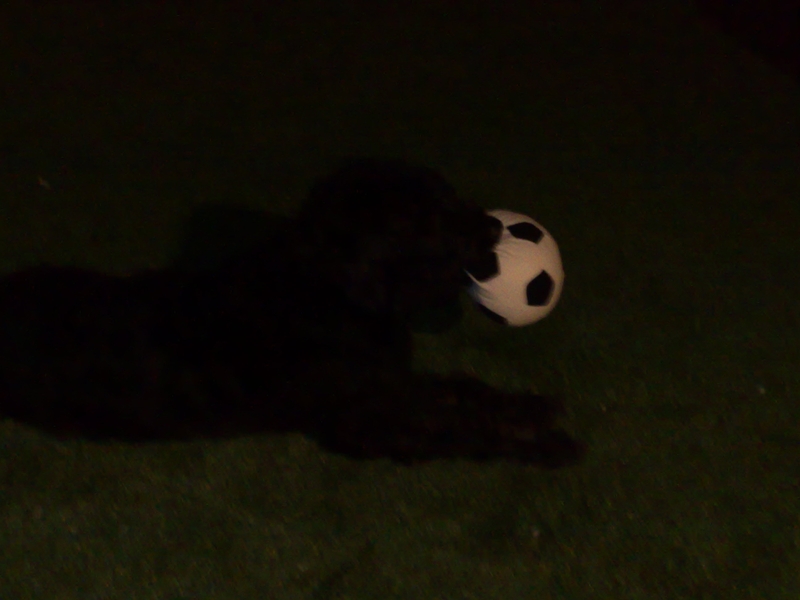 We recently went shopping for a few things (including a sofa cover…for muddy Barney) at IKEA and found a soft stuffed soccer ball/football. We brought it home and Barney went mad for it. He even went outside by himself for 20 minutes and played alone with it…an unheard of thing – he normally hates being outside alone for more than a minute or two. So we may have to go back and buy a few of these as I’m sure he’ll destroy it eventually, like he did Homer. But hurrah, we found a winner! Mummy went away again. I was so mad at her. She left me on Wed morning with a big scary bag behind her. I didn’t know what was going on. And then it was just me and daddy. I love daddy and we got lots of cuddles or so, but it wasn’t the same as being with both of them. Mummy has a game that we play all on our own, so I missed that. And then daddy told me that I was going in the car. Weeee…I love going in the back of our SUV. We drove through a scary road with lots of people and loud noises, and then he took me out of the car. It was dark and then I heard someone say my name. And it was mummy returned home from Brussels. She smelled like teenagers and the Eurostar. I was so happy and we cuddled in the back seat. It was a bit scary to see all the people as we drove by them, but I finally got home. And now I have mummy and daddy back again with me. I know, I’m spoiled, but I love it! Sometimes I wonder if he wouldn’t have been better off with a family in the country. He’s still so anxious of the unknown and reacts poorly when we’re walking him and he runs into even just oen person. I think he would have felt less anxious if he was in a remote place in the middle of nowhere, running around in fields and woods. But, well, he’s stuck with us. And so I still want to get him more used to being okay with the unknown. I need to step up my leadership role. I have to be consistent. He needs to know that he is utterly safe with me. It’s been not even five months, I know…but all I want is for him to feel the best that he can. We’ll get there. I know it. Patience is just not my virtue! There are tons of leaves on the ground, even in our more urban/suburban locale. And other dogs wee in those leaves so I have lots of stuff to smell. Mummy loves the fact that there are leaves on the pavement too…cause I tend to wee on them instead of on the concrete, and so I’m less likely to get wee on my paws as per usual. When mummy is happy, I’m happy. Because it gets dark early, I get really long walks during the weekend to make up for not getting walks in the fields in the evening. I have so much fun with other dogs then and get to see lots of my friends. It’s a lot colder now, which makes me happy cause I’m normally a bit warm (or even hot) with the big heavy coat that I have. Cold is good! When it rains, the puddles seem to be better and muddier and smellier…and I get to go face diving in them all! I love getting muddy and smelly. More baths. It seems as if mummy and daddy don’t like me go face diving so much. And so I get a lot more baths right now. I don’t like them. I try to get away, but just can’t. It’s a bummer. No more walkies in the park at night or with mummy in the morning. While the streets are fine, they just aren’t quite the same. Mummy is too scared to walk me in the park in the dark. I told her I’d protect her, but I guess the fact that old ladies seem to scare me didn’t give her much confidence in that. Well…that’s it from me for now. Mum and dad are feeling better after a round of stomach flu and hangovers, so I hope to have more pics in the near future of me having fun and running around!